*Disclaimer, I am a parent, not a doctor. This is not intended to be used as medical advice. If your child has a seizure, please contact a licensed physician. Please remember this was one family’s experience and yours may vary. Welcome Back. Originally, I had titled this blog piece “Part Two: Preparing for the hospital stay and testing”. Now that we’ve actually done it, I’m renaming this piece: “Part Two: Surviving the Hospital Stay and Testing”. Let me tell you why. The hospital where we were going to have to spend 4 days in was far from home, 3 hours each way, and in such a bad neighborhood that there weren’t even fast food chain restaurants nearby. Forget about a hotel. Even the Ronald McDonald House had bars on the windows and an armed guard. Yea, it’s THAT place. When we went for our first appointment, I stopped in the hospital cafeteria for lunch to see what we could expect, food-wise. I spoke to the manager and he asked me to spell “gluten” when I asked if they’d be able to accommodate my son’s multiple allergies. I took that as a no. The hospital also had a “NO FOOD DELIVERY” policy just to seal our fate. Also, I’m a single mom of two kids with autism. I’d be doing this all alone. All of this combined meant a LOT of pre-planning. I booked a hotel room (with a pool, Max’s favorite!) next to a Whole Foods about 20 minutes from the hospital since we had an early check-in time and I didn’t want to have to get up and drive across the state at 4am. I precooked all of my son’s food, froze 3 six-packs of water solid and filled the cooler. We got the last minute items at Whole Foods and showed up on time to check in. As instructed, we arrived at Admissions, 15 minutes early. They had no record of us and then when they finally found the record, they told us we were 4 hours early. Once they contacted the doctor, he let them know our appointment was at 10am, not 2pm, but then they told us they put another child in our private, reserved room. So far, this wasn’t going well. Breathe, mom. 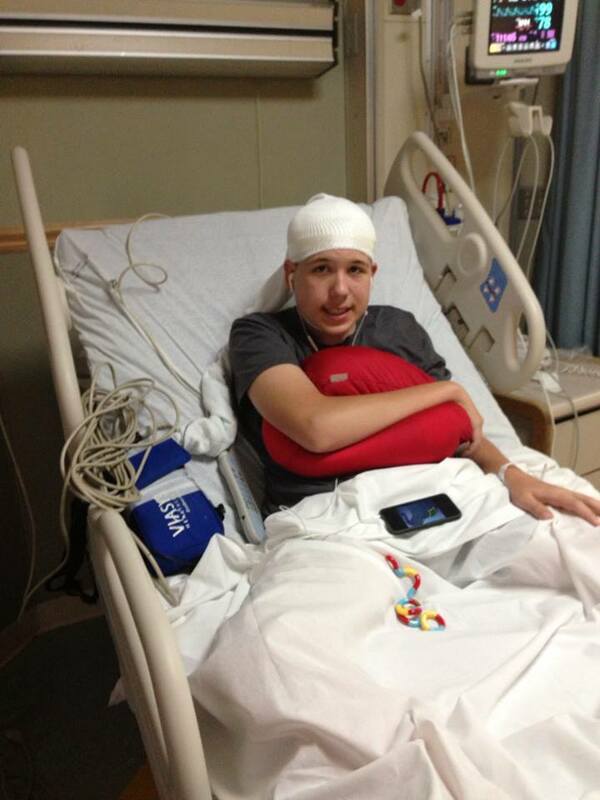 After filling out paperwork, they sent us to the EEG lab to get hooked up while the doctor dealt with the room issue. Since my son cannot tolerate the sounds of small children, coupled with the fact he’s 6’2” in a children’s hospital, we had preset with the doctor to have a private room for the 3-day EEG. Thankfully, they had such a room with the video cameras on the ceiling for the Video EEG. Once the doctor was told they filled the room, he contacted whoever he needed to and got them moved so we only spent about an hour waiting for the room in the EEG lab. Step One: Connect EEG The technician who put the EEG electrodes and “hat” on was great with my son. My son is a dream for people to work with; people always compliment me and him for his behavior and lovely disposition. He even smiled and flirted with the lady sent in to give him the IV. He may have autism, but he loves the ladies! Since my son hadn’t had an EEG in 15 years, I needed to explain and show him what was coming so he’d be able to cope. I had already showed my son these links to know what an EEG process would look like 1,2. Unfortunately, I was only able to find EEG “social stories” featuring small children 3,4,5,6. So I photographed the whole process with my son to be able to create a “big kids/adult” version of the process, which I’ll post on TACA’s website soon. I also wrote a visual schedule, 7 so he knew what to expect and when. I then gave this to him a week before the appointment so he could get comfortable with it. He’s very used to traveling all over the country with me and pretty much goes with the flow, but this was going to mean sitting in bed in a room for 4 days solid, then be separated from me when going to anesthesia. That meant prepping him to ensure a good outcome. A note: Max is hyperlexic and able to read so our schedule is just words, but if your child needs pictures, or more/less words, this is only meant to be an example. Basically, they take a grease pencil and make markings all over the head using a measuring tape to find the right spots, then they glue about 20-30 small electrodes to the head on those marks. They use a small air blower to quick set the glue, and beware as the glue is stinky. Then they use gauze to completely cover the head and all of the electrodes to form a “hat” of sorts and the wires hang off the back of their head, in a makeshift ponytail, covered in more gauze. Then you begin the vigil to make sure your kid doesn’t rip any off. For us, we were doing a Video EEG, meaning there was a video camera in the ceiling above my son at all times so that if I saw anything I thought was seizure activity, or even just “not him”, I pushed a button which would mark the EEG tape for the neurologist to look at that area closely. Whenever you push the button or the EEG shows a spike, the technician or neurologist can look at the video from that same time to watch the patient’s face and movements to help determine if it was seizure activity or not. If you did an ambulatory EEG, there wouldn’t be corresponding video to help the doctor diagnose, so the Video EEG is preferred diagnostically, but obviously it can be harder on the child or family if they cannot tolerate being in the hospital for so long. Also, some insurance companies don’t like to pay for in-patient stays that last 3-4 days so those things can affect your choice of EEG method. P.S. You will forget people are watching and videotaping you 24/7, so try to remember not to pick your nose or anything else you don’t want to amuse the EEG techs with. Or, if you want to make it fun, get up and do the Carlton 10 at random intervals. Life is too short to be boring, right? Then it basically became a waiting game. My son could get up and go to the bathroom while connected to the EEG monitor, but otherwise had to sit or lay on the bed 24 hours a day. He could read his books, surf YouTube, play games or watch movies on his iPad, do homework (we homeschool so we brought work to keep him occupied in case he fussed with the EEG leads), watch TV, or all the above at the same time. He’s a great multitasker when he wants to be! Be forewarned. For myself, I brought books, my iPad and a bunch of printed half-started articles to work on while the EEG was taking place. If you are doing a Video EEG, don’t bother. You are supposed to watch your kid, basically stare at them, the entire time they are awake, both to make sure they don’t pull the electrodes off but also in case they have any seizure-like activity so you can push the button. Not a fascinating way to spend 3 days, but necessary. Most children’s hospitals have pull-out chairs that the parent can sleep on next to the child’s bed. They are not comfortable, but they do the job. Bring jammies and slippers, it may be a hospital but those floors are filthy! We did have 4 electrodes come undone on the second day. We had to have the doctors call the EEG technician back in to reconnect them. It only took a few minutes to reattach them; otherwise the V-EEG went by without a hitch. I did see a few episodes, maybe a dozen during the 60 hours of footage we took, even though we don’t know if they were tics or seizures yet as the results are pending. Patient Advocate All hospitals have someone called a Patient Advocate. It’s someone who works for the hospital, but is there to make sure patients are treated properly. We almost called them at one point when it inexplicably took the EEG technician 6 hours to come and reconnect the EEG leads that had popped off, but I mention this so that if anything bad happens, you know this is an option. I did follow the complaints’ food chain – nurse > doctor > neurologist on call, to no avail. I gave the neurologist on-call a time frame before I would call the Patient Advocate. The EEG tech arrived 4 minutes before the time was up. “Being the squeaky wheel” is something I excel at, but I mention this so you know how and who to complain to when you think you are getting bad care. The IV My son is good with needles now. It wasn’t always the case, for sure. When he was little it would take 4 adults to hold him down for a blood pull, now he just sticks his arm out without flinching. He rocks! But this was the first IV he’d have that would just stay there for 18 hours. Since he only very recently tolerated a band-aid on for more than 2 minutes, I was pretty worried about him tolerating an IV, but he giggled and flirted with the phlebotomist who inserted it and other than a few “leave that alone”, he never fussed with it. He even slept with it on. Miraculous. Hospitals are like Vegas, but without the fun It turns out that “hospital time” is a fictional time zone, kind of like being in a Las Vegas casino where time just doesn’t matter, at least to the employees. When you have a 7am appointment, you MIGHT be seen by noon. A 2pm appointment means 6pm. This is pretty much at any hospital, so don’t assume your stay will be different. Having to keep a child NPO (nothing by mouth) for 6 hours or maybe 10 if that includes sleeping time, is not always easy, and keeping them NPO for 12, 14 or 16 hours without a clear end in sight, is a nightmare. It won’t matter to you if the hospital suddenly got slammed with ER cases or if their scheduler was just an inconsiderate jerk, when it’s your kid who’s hungry and pissed off. In order to have general anesthesia, you have to be NPO for at least 6 hours. Our original appointment for anesthesia was 7am, but we got bumped to 2pm. However, they said we “might” get bumped back to an earlier time slot, so they wanted me to keep him on no solid food from midnight until whenever they got around to us. I did not bring any clear fluids, like broth, for such an occasion. Now, we’re talking about autism here. Our kids don’t do “maybe” or “soon” well. I told them I wouldn’t play the maybe game and if by 8am, we weren’t heading toward anesthesia, then I was feeding my kid breakfast and we’d wait until 2pm, period. Sometimes you have to say no. This was one of those times. Anesthesia 5pm came around and I finally paged the neurologist, whose day had also been upended by the anesthesia scheduling change and told him we’d been moved out of the Video EEG room since we didn’t need the in-ceiling camera anymore, but another patient did. Also to tell him we were still waiting. There was a time limit on him being able to perform the spinal tap and get it shipped out on time to the lab. We were about to pass that limit. A few minutes later, they did come and give us a gown to dress him in and to let us know that an orderly would come to bring him down. I changed him out of his clothes, got him into the gown and the orderly arrived shortly after. We wheeled my son down to the elevator, and a few minutes later, we were in a room waiting for the anesthesiologist. We had already spoken to a fellow the day before about Max’s allergies and which anesthesia I wanted them to use or not use. Once she came in with her team, I reiterated Max’s allergies and his experiences with other anesthesia. He was allowed to keep his favorite comfort pillow with him, but the iPod and stim toy had to come back with me. Max was only having 2 things done under anesthesia, the LP – lumbar puncture, aka spinal tap – and the MRI. The LP takes about 5-10 minutes to perform and the MRI takes about 50 minutes. Still, it took 3 hours before I saw my son again. Too long for a nervous mom but we all survived. Food As I mentioned before, this hospital, a 140-year old Level 1 facility, which has had plenty of time to get their act together in regards to allergies, sadly, had not. My plan was to eat whatever food they sent up for my son and feed him the good stuff I brought for him. That didn’t work out very well however. The “food” they sent up was truly inedible. Inexplicable. Don’t get me started on how a “health care” facility could produce such garbage and feed it to sick children and ever expect them to get well. Anyway, I didn’t plan on having no food to eat for myself for 4 days, but that’s what ended up happening. Even the tap water smelled overwhelmingly like chlorine. And because I was there alone, I had no one to keep an eye on my son so I could run down to the cafeteria and grab something. By the time the nurses could spare someone to watch him for 10 minutes, the cafeteria was closed. Oh well, I could stand to lose a few pounds. Call it the “single parent autism diet”. Bloodwork: CBC, chem 4, immune panel, especially IgA; PANDAS (ASO titers etc) workup. I already know he pulled more blood work than the above so when the results come back, I’ll post the exact names in the third piece of this blog. The 20% club As I mentioned in the first piece of this blog, 80% of people who have one seizure will never have another one. After that first seizure, they give you a 20% “rating”. Then with testing and any future seizures, they can raise that 20% all the way to a 100% chance of having more seizures and having to go on medication. Mind you, this is NOT a guarantee either way. They could leave you at 20% and you could still have more seizures or they could raise you to 90% and you may never have more. But their calculations are based on hundreds of thousands of cases over time. They are pretty confident it is as accurate as they can get. Based on our preliminary results and the fact that Max hasn’t had any more seizures since the first one, we left the hospital still at 20%. We are hoping the complete testing keeps us there but we won’t know until all of the finalized test results are back. Advice So now that we’ve survived, here’s my advice to you so that you don’t have the hassles we had. Get your doctor’s pager or cell number so if anything goes wrong, you can contact them. Pack more than you think you will need, you can always take it back home. If you have a friend or family member who can go with you, bring them, even if they can just come for a few hours to bring you food or spot you so you can eat and shower. Before you go, find out if there is Wi-Fi in the rooms; plan accordingly. Better safe than sorry Know your anesthesia 9. Get your child’s prior surgery notes (if applicable) to show what anesthesia they’ve already had and any reactions to it. The final installment of this blog, “Part Three: The aftermath: What happens next?” will cover Max’s test results, future plans, research, treatments and resources. Thanks, Holly, for providing so much useful advice. Hospitals aren’t always the tidy, tightly-run organizations one envisions. And your comments about the dietary departments are on the mark — lots of fatty and starchy ag surplus commodities. And even if you do find some fresh fruit, you’re not going to find organic bananas and that apple is going to be a pulpy Red Delicious. Ecch.